I was interviewed by Swedish Radio P4 Halland. This interview covers a lot of what has happend in the study. So grateful for his continuous attention and support. JAMA Pediatrics published our latest study results today. We will return with more info, but some you can find under MEDIA. A short fact sheet is possible to download. In our own RCT; Andersson & al, BMJ. 2011 Nov 15;343:d7157 “Effect of delayed versus early umbilical cord clamping on neonatal outcomes and iron status at 4 months: a randomised controlled trial” the weight difference between early (less than 10 sec) and delayed (180 sec or more) newborns was 96 g or 26 g/kg implying a placental transfusion of about 90 ml. My concern is that by referring to the Vain study (as well as the Chaparro study in Lancet 2006 where DCC also was 2 min) there is a risk that a lot of newborns will be “intermediately clamped” and will not receive the optimal placental transfusion. "There is a lot going on in this field right now, so its difficult to stay up with everything, at the PAS-meeting this year there were many studies, ancillary studies and physiologic investigations that were relevant. I haven’t had time to digest them all. One important factor to consider is that the physiologic benefits demonstrated, in animal models, of delaying cord clamping are not due solely (or even mostly) to transfusion effects. Cardiovascular adaptation around birth is different when the cord is clamped after the onset of breathing, I am not sure if there is a similar study of the effects of cord milking, but I would guess that the effects would be quite different. I don’t think we should assume that the two procedures are equivalent, even if the same amount of extra blood is delivered." Delayed cord clamping or cord milking for the very preterm newborn… or both? Below he goes through the abstracts from PAS to find those that had new information, from controlled trials, about the efficacy and safety of cord milking and/or delayed clamping. The last day has been used for preparing the publication of our four year follow up paper on Tuesday May 26th. Talking and writing to journalists. 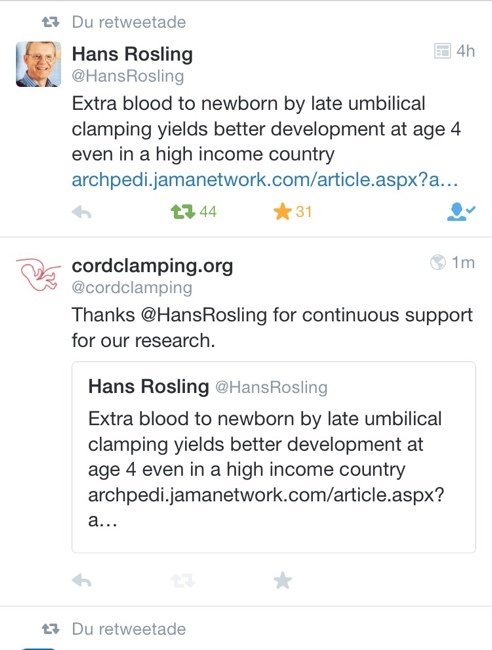 Today, cordclamping.org starts to take its first steps as a web page for people interested in umbilical cord clamping. Podcast about delayed cord clamping. Breakthrough for DCC in the US? Please note this site (cordclamping.org) does not constitute medical advice. related to any use of the content contained in, or linked to this website. to determine the appropriate course of action, treatment and management.